Then, on the mountain, he preached. MONG THE JEWS there was one class of men hated and despised by the people more than any other. That was "the publicans." These were the men who took from the people the tax which the Roman rulers had laid upon the land. Many of these publicans were selfish, grasping, and cruel. They robbed the people, taking more than was right. Some of them were honest men, dealing fairly, and taking no more for the tax than was needful; but because so many were wicked, all the publicans were hated alike; and they were called "sinners" by the people. At once, the publican rose up from his table, and left it to go with Jesus. All the people wondered, as they saw one of the hated publicans among the disciples, with Peter, and John, and the rest. But Jesus believed that there is good in all kinds of people. Most of the men who followed him were poor fishermen. None of them, so far as we know, was rich. And when he called Matthew he saw a man with a true and loving heart, whose rising up to follow Jesus just as soon as he was called showed what a brave and faithful friend he would be. The first of the four books about Jesus bears Matthew's name. "Why does your Master sit at the table with publicans and sinners?" "Those that are well do not need a doctor to cure them, but those that are sick do need one. I go to these people because they know that they are sinners and need to be saved. I came not to call those who think themselves to be good, but those who wish to be made better." One evening Jesus went alone to a mountain not far from Capernaum. A crowd of people and his disciples followed him; but Jesus left them all, and went up to the top of the mountain, where he could be alone. There he stayed all night, praying to God, his Father and our Father. 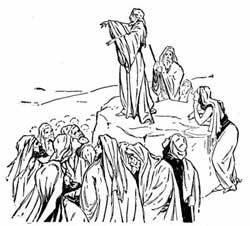 In the morning, out of all his followers, he chose twelve men who should walk with him and listen to his words, so that they might be able to teach others in turn. Some of these men he had called before; but now he called them again, and others with them. They were called "The Twelve," or "the disciples"; and after Jesus went to heaven, they were called "The Apostles," a word which means "those who were sent out," because Jesus sent them out to preach the gospel to the world. The names of the twelve disciples, or apostles, were these: Simon Peter and his brother Andrew; James and John, the two sons of Zebedee; Philip of Bethsaida, and Nathanael, who was also called Bartholomew, a name which means "the son of Tholmai"; Thomas, who was also called Didymus, a name which means "a twin," and Matthew the publican, or tax-gatherer; another James, the son of Alpheus, who was called "James the Less," to keep his name apart from the first James, the brother of John; and Lebbeus, who was also called Thaddeus. Lebbeus was also called Judas, but he was a different man from another Judas, whose name is always given last. The eleventh name was another Simon, who was called "the Cananean" or "Simon Zelotes"; and the last name was Judas Iscariot, who was afterward the traitor. We know very little about most of these men, but some of them in later days did a great work. Simon Peter was a leader among them, but most of them were common sort of men of whom the best we know is that they loved Jesus and followed him to the end. Some died for him, and some served him in distant and dangerous places. "Blessed are they that mourn: for they shall be comforted. "Blessed are the meek: for they shall inherit the earth. "Blessed are they which do hunger and thirst after righteousness: for they shall be filled. "Blessed are ye when men shall revile you, and persecute you, and shall say all manner of evil against you falsely, for my sake. "Rejoice, and be exceedingly glad: for great is your reward in heaven: for so persecuted they the prophets which were before you. "Ye are the salt of the earth: but if the salt have lost his savor, wherewith shall it be salted? it is thenceforth good for nothing, but to be cast out, and to be trodden under foot of men. It was in this Sermon on the Mount that Jesus told the people how they should pray, and he gave them the prayer which we all know as the Lord's Prayer. "And the rain descended, and the floods came, and the winds blew, and beat upon that house; and it fell not; for it was founded upon a rock. "And the rain descended, and the floods came, and the winds blew, and beat upon that house; and it fell: and great was the fall of it."